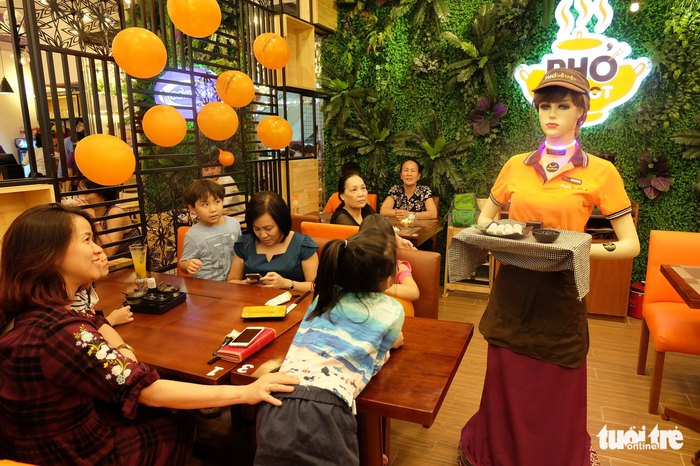 A number of restaurants in Ho Chi Minh City have been ‘employing’ a robot waitress to add a highlight to customers’ dining experience. The apron-wearing robot, called ‘Co Ba’ (Miss Ba) in Vietnamese, was designed by a group of undergraduates from the University of Technology and Education (UTE) in Ho Chi Minh City. “Hello there, I’m Co Ba. Enjoy your meal,” the female-looking robot said in a thick Mekong Delta accent, holding out a tray of food at each stop along its tour around a restaurant in Ho Chi Minh City as a human waitress served the dish to amused diners. Co Ba the robot waitress has been a sought-after asset among local culinary businesses, with restaurateurs willing to pay plenty per hour for her service, thanks to the android’s popularity among local and foreign customers alike. Co Ba is programmed to be capable of passing greetings, introducing herself, and familiarizing customers with a restaurant’s specialties. Peter, a tourist from Hungary whom your correspondent met at a restaurant in District 2, said it was the first time he had been served by a robot at a diner, and that the experience was one-of-a-kind. According to Nguyen Than Huy, a senior from UTE who leads a team of seven undergraduates to design the robot, heat and ultrasound sensors are installed on Co Ba, allowing the robot to move around and avoid obstacles by herself when she is not in manual control mode. Huy’s group has been working on Co Ba since late 2013, with the first prototype of the android having been introduced in 2015. The early version was put on a month-long test run at a coffee shop but was found to be lacking the stability needed for long working hours. “Stability is the most challenging part in designing practical robots, as inside this 1.6-meter-high android are around 40 different electronic components. Good coordination is required between the moving parts, the electronic circuits and the central program that controls them all,” Huy said. The team said they welcome any feedback on the robot to further improve its design and capabilities. Currently, the group is looking to introduce the next version of Co Ba in mid-2018, which will have a more human-like appearance thanks to the use of silicon material for its skin.